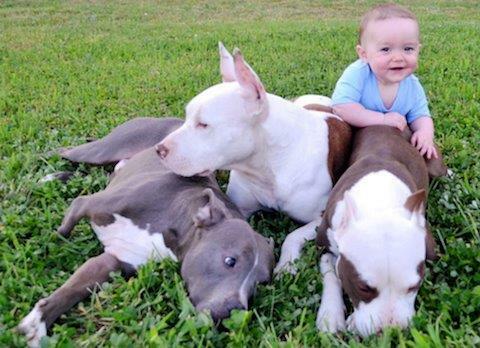 According to the Los Angeles Times, Pit Bull Terriers are one of the most populous breed of dog in Los Angeles. So it's no surprise that in L.A.'s six city shelters, there are a lot of Pit mixes and "Pitties" (a catch-all term for American Staffordshire Terriers and American Pit Bull Terriers). More than many other breeds, Pits evoke strong feelings in people, both pro and con. For the past three and a half years, I've volunteered with the city animal shelters of Los Angeles, working to find homes for homeless dogs. 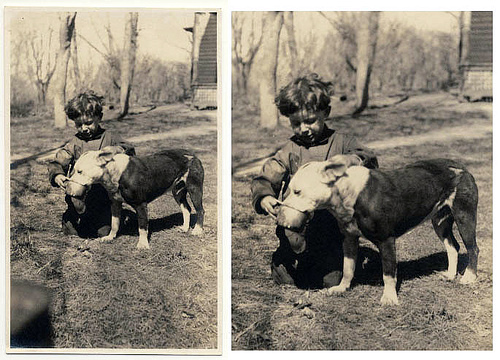 In that time, I've met a lot of lovely, sweet, gentle Pits. I've also seen some that have scared the pants off me. Add the topic of children into the argument for and against Pits, and emotions ratchet up sky high. 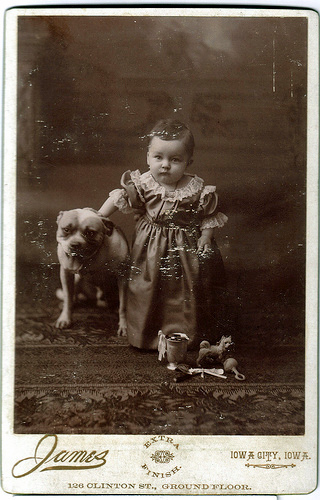 But did you know that, a century or so back, Pit Bulls were used to babysit infants and children? Their natural, protective tendencies were well suited to the task of looking after little kids. 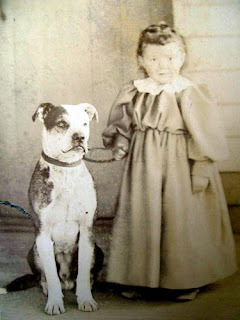 In the late Victorian era and early 1900s, Pit Bulls were nicknamed "Nanny Dogs." I've been telling potential dog adopters this interesting factoid for years now. 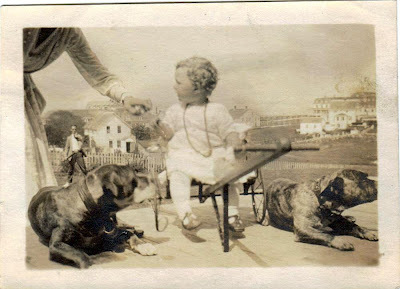 But until recently, I didn't know I had a personal connection to "Nanny Dogs." Then this family photo, below, turned up. 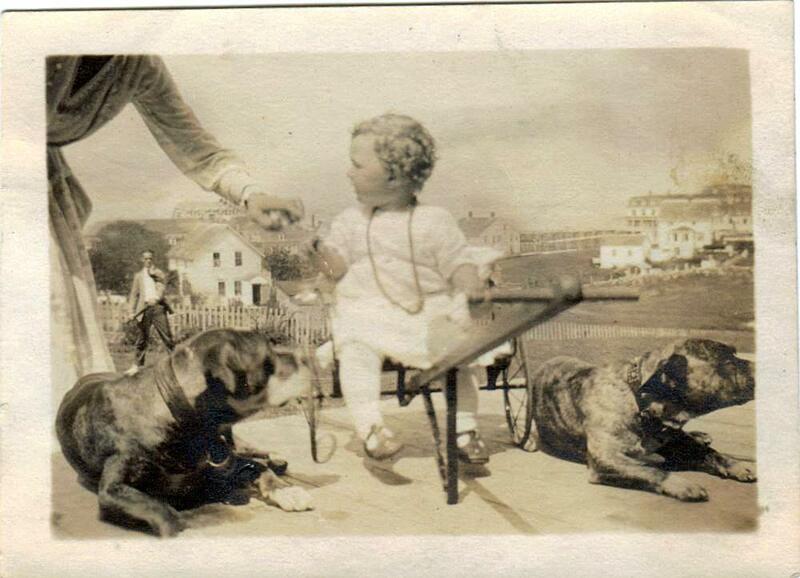 It's my mother, about 18 months to 2 years old, flanked by two Pit Bulls. That's my Nana, reaching in from the left. In the background, that's my Grandpa Ramsay, I think; it's a little hard to tell. 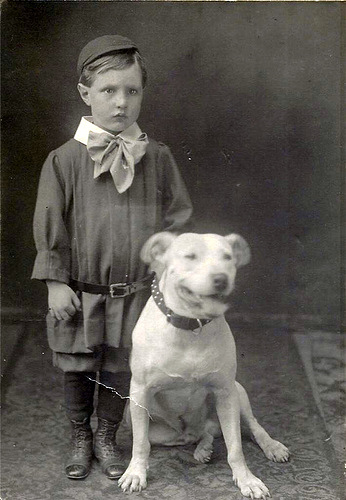 But I can tell this for sure; when I talk to people about "Nanny Dogs" now, I can speak with more conviction. Wow -- I've never seen this photo of Mom before :-). THe animals rescue group I've been with for 30 years (Nike Animal Rescue Foundation) has been successfully re-homing "Pitties" for years -- with careful selection from the shelter, very thorough screening for good/appropriate homes,and mandatory training w/ family and dog from our NARF-approved trainer, we are successful at finding these dogs their Forever Homes. It works! Yet only a few km away, many weatherboards are being bulldozed to put up two story cement wall (very quick construction) developments with virtually no front or back yards. They destroy the neighbourhood and the aminity of the houses next door. But its just progress hey?